You’ve gathered your hungry group, created a shortlist of tempting eateries and loosened your belt for the feast ahead. 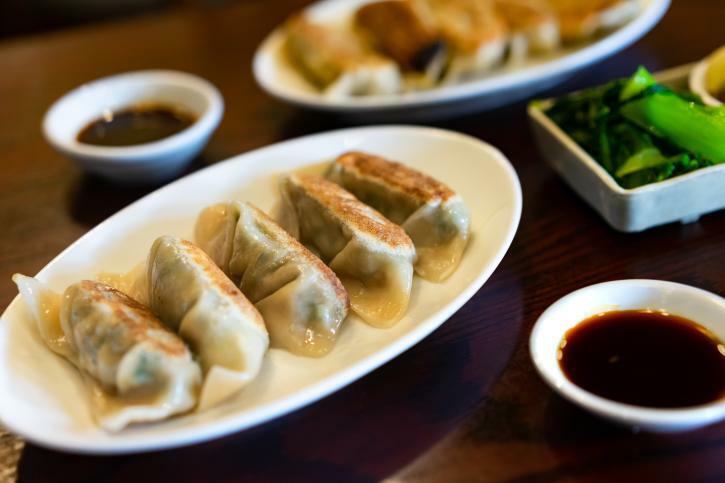 Hitting the Dumpling Trail in Richmond—20 restaurants, cafes and food court counters specializing in that most delectable of Asian comfort foods—is the perfect excursion for anyone who loves eating well and discovering new dishes. But while it’s easy to use one of our suggested itineraries or plot your own route via our handy Trail map, what exactly should you sample? For hungry trekkers planning a culinary adventure, here are 10 dumpling varieties to try in Richmond, complete with handy info on where (and when) to find them. Hungry? It’s time to dive in. If you find a favourite you’d like to recommend, snap a dumpling photo or two and let us know via social media, using the #RichmondMoments hashtag. We’d love to know what you find! What: Steamed, hot, and much more filling than you might think, these soft, tapioca-wrappered balls enclose delicious shrimp and prawn centres. Expect your mouth to involuntarily open for cooling purposes as soon as you pop one in. When: During dim sum hours only (typically 10:00am to 2:00pm). Where: Empire Seafood Restaurant, The Jade Seafood Restaurant, Shiang Garden Seafood Restaurant, and Parklane Chinese Restaurant. What: One of Korea’s tastiest contributions to the dumpling table, these popular savoury treats are sometimes shaped like the tricorne hats seafarers used to wear. But don’t try deploying these boiled, steamed or pan-fried parcels as headgear. Instead, combine these pork-filled goodies with some kimchi and a mildly spicy sauce. Where: Samsoonie Noodle & Rice. What: A pan-fried Japanese treat that’s become one of the world’s most popular mainstream comfort foods in recent years. Soft, warm pockets of tasty goodness, they typically come with pork or seafood fillings, and are ideal for some generous soy sauce dipping. Where: 4 Stones Vegetarian Restaurant and Dinesty Dumpling House. What: Originating in Shanghai, these pork dumplings hold a little surprise that you might not be expecting: they’re also filled with hot soup, which you may end up wearing if you’re not careful. The perfect antidote to a chilly day, these delicate parcels of liquid-infused delight are a favourite of many locals. Where: R&H Chinese Food, SuHang Restaurant, Dinesty Dumpling House, and Empire Seafood Restaurant. What: A perfect, elliptical parcel combining a soft-but-crispy outer layer and a tasty interior of minced pork, it’s hard not roll your eyes with pleasure as you sink your teeth into these delightful dumplings. Where: Parklane Chinese Restaurant, Empire Seafood Restaurant, The Jade Seafood Restaurant, and Shiang Garden Seafood Restaurant. What: Dim sum doesn’t only mean soft, glutinous balls of warm deliciousness. Behold the wu gok, a light, crispy taro puff with a tangled haystack exterior of crunchy strands enclosing a velvet-smooth interior of mashed taro and ground meat. Where: Empire Seafood Restaurant, The Jade Seafood Restaurant, Shiang Garden Seafood Restaurant, Parklane Chinese Restaurant, and Dinesty Dumpling House. What: Another globally successful comfort food classic, many local diners have very clear ideas about their favourite Richmond wontons. This versatile little dumpling might be deep-fried to perfection, bobbling in clear broth or simply elevating a steaming bowl of hearty noodle soup. Fillings can also vary, with shrimp and pork fusions prominent. Where: R&H Chinese Food, Cheng Du Xiao Chi, SuHang Restaurant, Dinesty Dumpling House, 4 Stones Vegetarian Restaurant, and Tsim Chai Noodle & Restaurant. What: Small, colourful, and irresistible, these steamed pork dumplings are often topped with bright-orange clusters of salmon roe or sometimes a glistening whole prawn. Perfect for sharing, be prepared for an unseemly tussle over the last one! What: Just when you’re thinking that every single dumpling in the world is savoury, these fried Chinese pastries roll in to tempt your sweet tooth. Fashioned from rice flower and filled with different varieties of sweet paste (often lotus seed paste, red bean, or black sesame, for example), they’re studded with sesame seeds for an added crunch. Where: The Jade Seafood Restaurant, Shiang Garden Seafood Restaurant, Parklane Chinese Restaurant, and Empire Seafood Restaurant. What: A Vietnamese delicacy, these soft, slender, tapioca-skinned treats are filled with shrimp and pork, and are typically topped with a sweet chili fish sauce when they arrive—fresh and glistening—at your table. A great starter, order a couple of plates to share. Where: Banh Mi Tres Bon.